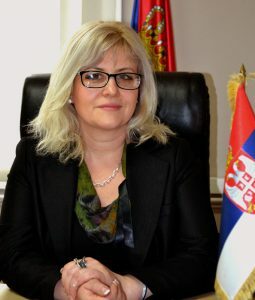 he duty of a district chief is currently performed by Dragana Tončić. She was born in Pirot, on November 25th, 1970. Dragana Tončić received her primary and secondary education in Pirot. She graduated from the Department of Business Economics of the Faculty of Economics, at the University of Niš. Holding the Tigar Corporation scholarship, she was employed there as a trainee, after obtaining her bachelor´s degree in economics. Upon completing her trainee period and passing her internship, she worked in the Investment Function Department. She was appointed the head of the Investment Function Department in 2014 and she performed those duties until she started working for the Pirot District. Dragana Tončić has gained considerable fieldwork experience in the Tigar Corporation. She took over her duties on March 7th 2016, pursuant to the Government decision of February 27th, 2016. She is married and has two children. A state administration authority shall transmit to the Head of an administrative district the directives and operational instructions issued to its district territorial unit, as well as the excerpt from the state administration authority business plan pertinent to its district unit. The Head of an administrative district shall answer for his/her work to the Minister of State Administration and Local Government, and the Government. Upon the proposal of the Minister of State Administration and Local Government and in accordance with the Civil Servants Act, the Government shall appoint the Head of the administrative district to a four-year’s term.